Service Costs > How Much Do Pothole Repairs Cost? Pothole repair refers to fixing a section of the asphalt or concrete road the has broken or caved in. These holes can be anywhere and will most likely encounter them no matter where you are headed. If you hit a pothole going too fast, it can cause a flat tire or can even cause damage to the wheels, axles, and alignment of the car. Potholes are caused when water penetrates the top portion of the asphalt and then moves deeper to create the cracks in the roads. Once these cracks are formed, they can quickly turn into potholes by constantly driving over them. If the potholes are on public roads, the city will absorb the cost of fixing them. If a pothole is formed in your driveway, however, you will be responsible for the bill. The cost of pothole repair will depend on the size of the pothole and the company you hire to perform the job. How much does it cost to repair a pothole? To have a private company come out and patch a pothole in your driveway, this pothole repair could cost anywhere from $150 to as much as $300 for each job. It is best to figure a $100 initial visitation fee and $25 to $35 per pothole. However, some local companies may have some hefty minimum fees due to the materials and work involved. To receive an exact quote in your area, consider getting multiple quotes for free from HomeAdvisor.com. Simply explain your job and licensed contractors will email you with a quote. For those who want to do the job on their own, common fillers can be purchased for as little as $20 for a 50-pound bag. The job should cost you no more than $50 for a handful of potholes. According to the city of Toronto, the city would pay for around $25 per pothole that is repaired on a public road. Governing.com discovered the local government and its DOT workers would charge $23 for each pothole, while with a private firm and/or contractor, the potential cost could reach as high as $129 per pothole. Among the first factors that can affect the pricing will be the type of material used to cover or smooth over the pothole. The most common solution used nowadays is the injection types of sprays. There are different grades of asphalt, and the higher the grade, the higher the price will be. The extent of the pothole repairs is based on the number of holes that are present. Thus, the more holes you need to have repaired, the higher the price you will have to pay. However, you will pay less per pothole. Typically, the repair process is best done on a warm day. This is because the asphalt coating will be soft and easier to bond with the new mix. Before the new asphalt is laid out, the loose gravel and asphalt will be dug out. Afterward, the area will be swept and all the small, loose pieces will be cleared. Once the area is cleared, the pothole will be watered down with a quick spray. The pothole will be filled with a cold patch and a shovel will be used to compact the asphalt. Once the layer is compacted, the area will be swept again and cleaned up. For a more professional job, the pothole can be repaired using hot asphalt. This is much more effective but will be at the high end of the price spectrum. After the hot asphalt is laid, it will be flattened and compacted with a steamroller rather than a simple shovel. If you plan to do the job yourself, the asphalt mix you purchase at the store should include instructions to guide you in the mixing and application of the asphalt. For the pothole repairs that cover much larger areas than the average size potholes, the extent of the use of the injection sprays and other tools would vary. In some cases, there would also be the requirement to use cement. If you are repairing potholes in your own driveway, you may need to purchase additional equipment such as containers, sprays, and brushes to work with the solution. If you properly maintain your driveway, you will be much less likely to see potholes formed. Maintenance includes having the drive seal coated to prevent water from seeping into the asphalt. You should also try to avoid standing water on the driveway; if you see a puddle, try to brush off the water with a push broom. 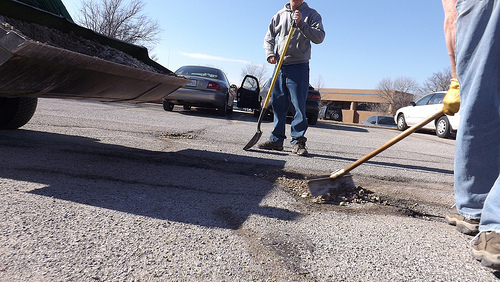 If the pothole repairs are typically not a part of your area of responsibility, then the best thing that you can do is to inform the local city government of the need to have some areas repaired. However, if the potholes are in your driveway, then you should do the necessary research for the best do it yourself pothole repair kits that will help you fix the potholes. HowStuffWorks.com has a do it yourself guide, for example, that you can follow. If you want to hire a company to perform the pothole repair for you, try to use the same company that installed or sealcoats the driveway. If you are loyal to the same company, you may receive discounts.